Have you seen the colorful outfits from Freckles+Kitty, the delightfully sweet clothing company out of California? Today through Thursday (7/17 - 7/19) zulily is running a contest where we can BOTH win three dresses for our little ones from Freckles+Kitty! Just post in the comments section below which Freckles+Kitty item is your favorite, and if my blog is selected, I'll choose someone from all the commenters to win something lovely for the little lady of their choosing! Don't know much about Freckles+Kitty? Freckles+Kitty is California made toddler and girls clothing inspired by what’s popular now. The best part is that zulily has select Freckles+Kitty styles up to 65% off! You’ll find brilliant colors and trending details such as floral appliqués, printed lace, hoodies, sets, and, of course, ruffles. Lots of ruffles! They use soft fabric blends to give your little girl exceptional comfort with a sense of style and fun. These fabrics are always easy-care and washable. Each Freckles+Kitty garment reflects the California spirit, and it’s these details that make each piece playfully individual. Check out Freckles + Kitty on sale at zulily! They have many cute items, I like their PInk and Green Flower Ruffle Dress. 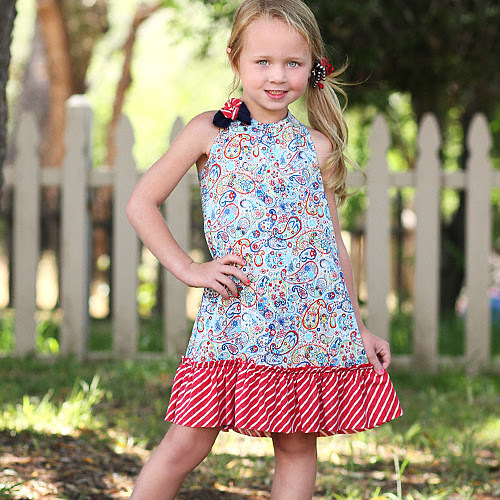 I love the Red Daisy Patchwork Ruffle Tunic & Shorts!